Fitting then, that the 60-year-old retired Nordstrom shoe salesman would pay to plaster the four-letter word across Spokane in the form of two towering billboards overlooking motorists on some of the city’s busiest roads. 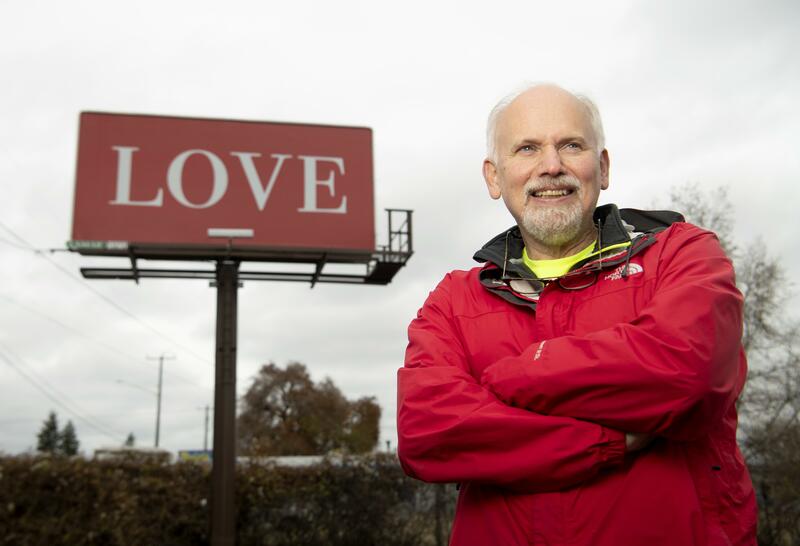 He plans to erect two more in the Lilac City, and on Tuesday, he received word that his billboard in Pittsburgh had gone up according to plan – his own personal love letter to the victims of October’s deadly synagogue shooting. Pogachar doesn’t pay much attention to the news. Most of the updates he gets from the world at large come in the form of a telephone coaching call with about 50 other people across the nation that he takes every morning within the confines of his South Hill home. But after hearing about the Oct. 27 massacre, when a man opened fire on a Pittsburgh synagogue killing 11 people while shouting anti-Semitic slurs, he knew he had to get involved. First it was just a thought: Why not put love on a billboard, just as an expression and not advertisement? Then it grew. And grew. And before long, Pogachar said it was a nagging proposition seared into the back of his mind. Then he spent two weeks camping in Kings Canyon National Park in California’s Sierra Nevada mountains. The idea had a shape and a place. With the help of Nick Lewis, owner of Kingsley and Scout clothing store on North Monroe Avenue, Pogachar designed a simple logo, and the first two billboards were erected Monday. One on Market Street and Francis Avenue, the other at Marietta Avenue and Hamilton Street. Pogachar said another will go up on Cleveland Avenue and Monroe Street on Friday, and the last on Monday at Dishman Mica Road and Eighth Avenue. Each billboard cost $950 for one month, but he said several people in his coaching calls pitched in to help. On Tuesday morning, less than 24 hours after his Market Street billboard had gone up, he’d already met a fan. And now that he has his billboards, and a website to boot, he said he’s sure to keep the campaign going. Where it heads is anyone’s guess.